Under Quarantine takes you into the dreaded Quarantine Zone and down into the murky sewers beneath Malifaux City. This book expands on the options present in the Fated Almanac, allowing players access to dark magic and noxious chemicals. Inside you will find new options for character creation, including new Pursuits and the ability to play as one of the undead. 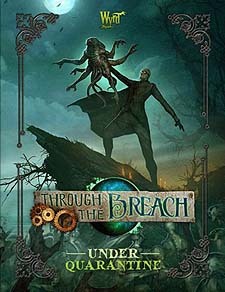 Under Quarantine is an expansion book for the Through the Breach roleplaying game. It requires the Fated Almanac to play.